The second expansion for the psychic warrior class clocks in at 10 pages, 1 page front cover, 1 page editorial, 1 page SRD, 1 page advertisement, leaving us with 6 pages of content, so let’s take a look! First things first: In order to use all parts of this book, you need Psionics Augmented: Psychic Warriors I; that becomes relevant in the feat-chapter, which btw. also features the reprints of Tap Animus and Extra Animus- you know, the feats, that frickin’ should have been in part I because more than half of the content was based on the frickin’ animus system? Ähem. Sorry. Anyways, where was I? Oh yeah, new archetype! The pdf introduces the Silhouette, whose signature ability replaces warrior’s path and expanded path, but retains second path and twisting path + pathweaving thus don’t work, but still can be traded in via archetypes. The silhouette gains shadowboxing, which manifests a fully-healed so-called shadow upon regaining power points. This construct can share the space of the silhouette freely and may even blend with its shadow, but cannot stray further than close range from the character before winking out and reappearing in the character’s space. If the shadow is destroyed, the silhouette can, as a full-round action that provokes AoOs, reform it by expending character level power points. The silhouette and the shadow are linked, sense-wise, which replaces the first level’s bonus feat. Directing the shadow double is a free action, just fyi. The shadow (stats on page 5, btw. – the pdf has a “page X” remnant here) gets darkvision 60 ft., low-light vision, is a construct, shares the creator’s AC and saves, but also is a construct (OUCH). It has neither Con nor Int, Wis and Cha 10 and its Strength and Dexterity are equal to that of the creator. It has 1/2 the creator’s maximum hit points and duplicates changes to reach, size, etc. of the creator. Thankfully, it cannot ready or delay actions, but it can use all combat and teamwork feats of the silhouette and may use skills (see below) and abilities as though sentient. The silhouette may share bonuses and effects affecting him also affect the shadow, but this does not double bonuses – so no double-sharing. Kudos for catching that. The shadow can copy the weapons wielded by the silhouette and the complex ability manages to prevent consumable weapon abuse, though, for VERY low-powered games, it should be noted that it can generate indefinite amounts of nonmagical ammunition – which can be problematic in very resource-conscious games or those using ammunition cost as low-level balancing for firearms etc. Speaking of potential hiccups: A sidebar talks about interaction with soulknife multiclass options, which brings me to one concern, namely panoply of blades and the like – while the pdf cleanly allows that, I’d strongly suggest to GMs to disallow that combo. Don’t say I didn’t warn you…The prestige class progression notes don’t come with such a caveat from yours truly, mind you. Oh, but if you’re thinking by now: “Why isn’t endy screaming brimstone right now?” Well, the shadow is limited. Unless via some shadow talents, the shadow cannot make actions on its own. It can flank and use roll-less abilities, but it is mostly limited to Follow-Up: 1/round, when the silhouette misses an attack, the shadow may make an attack versus the target as a free action, even if it’s not the shadow’s turn – provided it can reach the target. Penalties on the original attack are carried over to the shadow’s duplication of the attack. Shadow Talents can be used to add iterative attacks to the shadow’s follow-up ability. As a standard action, the right shadow talent does allow the silhouette to delimit the action-limit imposed on the shadow, which also allows for interesting strategies. Limited, scaling damage redistribution to the shadow, channeling touch powers through it, sharing non-general feats…and there is an option to gain two shadows…but, for balance’s sake, they thankfully still share the same pool of actions. All in all, a very powerful, but also extremely cool archetype – and frankly, I think it works as a rather strong option in regular fantasy campaigns. While it’s not made for grittier games, I really enjoy the engine it employs in all but details. Two big thumbs up from yours truly! 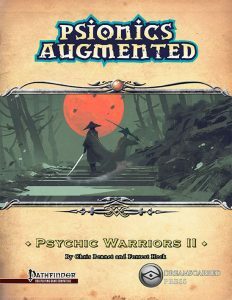 The second part of the pdf contains the feats…and a bunch of them frankly should have been in Psionics Augmented: Psychic Warriors I. Metapsionic Animus, for example, which builds on the halo knight’s animus-psionics engine and allows for the paying of metapsionic costs with animus (sharing the delimiting concern I voiced there). Psi-Animus Assault further increases the damage of Psionic Fist or Psionic Weapon by +1d6 for 1 point of animus, +1d6 at 4th level and every 4 levels thereafter, with correspondingly higher animus costs. Ranged Martial Power…does NOTHING. You can use martial power when making ranged attacks. Yeah, you could do that before – ranged TOUCH attacks were prohibited by the class feature…for good reason, I might add…Warrior’s Focus is pretty insane – it nets you an additional psionic focus that can be used only in conjunction with warrior’s path abilities. Not getting near my game. The three warrior’s paths introduced in the previous pdf also get feats that expand upon them (why were they not in #1? ): Advanced Anomalous Path adds the trance benefit to touch AC for powers, spells and psi- and spell-like abilities and increases the animus gained from the maneuver by increasing the die-size to d6s. Advanced Hungering Path renders those that fail a save versus your powers or abilities in the debuff aura sickened for 2 round. The drain is enhanced to also inflict 1d6 hit point damage, +1d6 at 7th level and every 4 levels thereafter. It also nets you temporary hit points when leeching thus. These thankfully do not stack with themselves…kudos there. The Advanced Outrider Path’s benefit is pretty nasty when passing an opponent within 5 ft. with the mount granted from the trance, you deal Wisdom modifier force damage, though it thankfully has a balancing caveat that makes this only possible 1/round/enemy…though I still wish that limit would make some sense in-game. Advanced Gladiator Path lets you move 5 feet when in trance and failing a combat maneuver or having an enemy fail a combat maneuver against you. Additionally, the maneuver of the path may be made 1/round as a free action as part of an attack – expend the psionic focus and make a combat maneuver attempt as part of the attack action. Adrenal Overchannel allows you to use Overchannel to grant yourself a +1 insight bonus to atk, +2 insight bonus to damage rolls instead of the ML-bonus. This increases at 8th and 15th level to +2/+4 and +3/+6, respectively, while conversely increasing the damage taken to 3d8 and 5d8, respectively. Editing and formatting are very good on a formal and rules-language level – for the most part, this is as precise and amazing as we’ve come to expect from Dreamscarred Press, though the “see page X” glitch and the feat that does nothing are both uncharacteristic blunders. Layout adheres to Dreamscarred Press’ two-column full-color standard and the nice artwork on the cover is duplicated herein, making for a nice visualization of the silhouette. The pdf comes properly and fully bookmarked this time around – nice! The pdf also comes with a second, more printer-friendly version. I really, really wished Dreamscarred Press had chosen a different way to split the content between this pdf and Psychic Warriors Augmented I. I honestly consider it really sucky that part #1 lacked the feat required for the archetype…and now, we have the supplemental material for the warrior’s paths introduced in #1 here, in #2…alongside more feats made for the halo knight…and nothing for the amazing silhouette. Let me make that abundantly clear: The silhouette is glorious. I love it. The dynamic gameplay, strategic choices, the limits imposed and means to offset them – Chris Bennett and Forrest Heck really show their design-muscles here. Big time. The archetype, on its own is pretty much pure amazing, if pretty potent. The same, alas, cannot be unanimously said for the feats and the distribution of content. The soulknives-installments didn’t have that issue to this extent, so why start now? Especially when the solution would have been so simple: Anomalous path and all the Path of War crossover Halo Knight stuff in one pdf, reaver and silhouette in the other. Paths and feats that build on paths in the same pdf. Done. Not that hard. I assume that some snags in the production cycle caused this decision, but it still leaves a sour taste in my mouth. Such operations always hurt the respective files. That being said, even while the majority of the feats herein build on material from book #1, the pdf is clearly designated as such and makes that clear on the product page, so it gets a pass in that regard. Still, the feat-chapter leaves me more ambivalent than I’d like and I’d strongly suggest GMs checking these very, VERY carefully before allowing them…but still…get this if the silhouette even remotely interests you. While I do not agree with the soulknife-notes, that is the only big flaw I could find with it and it’s based on my ambivalence regarding the mechanically amazing, but balance-wise problematic options there, and NOT, let me reiterate, NOT the fault of the archetype. Tl;dr: Silhouette = amazing; supplemental material = not so amazing. Still, for the more than fair and low asking price, this is well worth a final verdict of 4 stars. If you’re playing a really high-powered game/enjoy Path of War-style gameplay and have the first pdf, feel free to add a star to this, as you’ll get more oomph out of the halo knight. You can get this cool archetype here on OBS!